Maybe it was first-game gitters or the defense of the MHEA Eagles, but the Munford Cougars had a slow start to begin the 2013-14 campaign. Butch Hopkin’s squad missed a few layups and took jumpers quickly within the offensive scheme. And the new scoreboards in the Munford Gymansium read 30-24 at the break in favor of the Cougars. But Munford regrouped in the second half with defense and a smoother offense to pull away Nov. 12 with a 66-48 win over the Eagles. “We talked about putting the pieces together,” Hopkins said. “In the first half we were all trying to win the game on our own. In the first quarter the Eagles had better shot selection taking a 18-16 lead. Munford did have one highlight in the opening period when Kylon Hall got loose on a fast break and threw down a one-hand slam. It was a Hall layup early in the second quarter to tie the game at 21-21. Then a score by Juane Tolton gave Munford a 23-21 lead. Then Cougar point guard Reggie Holmes made the advantage 25-21 with a steal and bucket. To close out the first half Holmes located Tolton racing to the rim for a layup to make the halftime score 30-24. In the third quarter both teams drew even scoring 11 points. Tolton and Holmes helped the Cougars keep pace with MHEA. Holmes drained a triple and used his defense to create a basket to make the score 41-35 entering the fourth quarter. 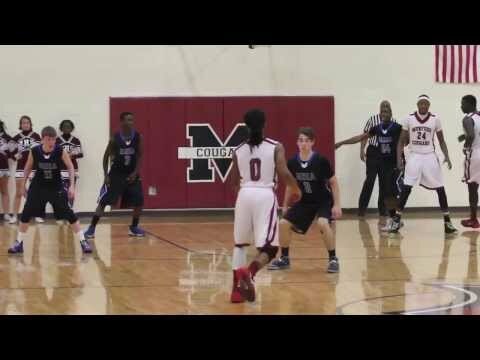 Then Cougar forward David Hunter displayed his skills from the perimeter and in the paint to help Munford pull away. To begin the fourth period, Holmes dished the ball to Hunter for a layup to make the score 43-35. After Holmes and Tolton scored to make the lead double digits, Hunter score again to make the tally 49-38. Later in the quarter Hunter drained back-to-back jumpers from the elbow that made the score 57-43. And toward the end of the game, the 6’6 Hall took his turn at passing the ball hitting Hunter for an uncontested layup that made the new scoreboard read 61-45. Seconds later, Hall received the ball in the post. He fired a no-look pass to a cutting Hunter for a bucket and a foul. Hunter completed the three-point play making the score 64-45. Munford left the court 1-0 and with a 66-48 victory. Hopkins said the second-half, Cougars can compete with the best in West Tennessee.